The cover for this book is just gorgeous, and between that and the first chapter, it really drew me in. There are some interesting concepts and politics, actually: I was worried from some of the reviews that it really wouldn’t hit that mark, but the way the queen uses the people around her, even her son, does actually manage to hit some interesting notes. There are a couple of twists I wasn’t really expecting, but in that way where they made sense when they happened, so kudos on that. Overall, though, thinking about it now, it feels rather thin. I liked the concept of Twylla’s power and was quite prepared for it to be real; the way the plot plays out is actually a little disappointing, since the original idea is so tantalising. It’s also pretty heavy on the romance, and though there are one or two good scenes, mostly I wasn’t that taken with it. 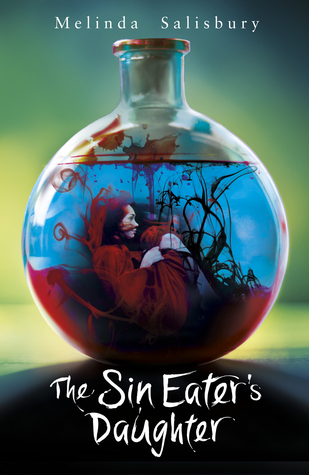 The title is disappointing, too; Twylla might be the sin-eater’s daughter, but that’s not really important to the plot, doesn’t really mean anything in the grand scheme of things. A lot of what I found interesting — like the sin eating — was background, or not real, while the elements I was least interested in were focused on. Enjoyable enough, but not something I’m desperate to read more of. I’m glad I haven’t already picked up The Sleeping Prince; I might in the end, but not immediately. It is a beautiful cover. I would say, unique, in the real sense of the word. It really is. I kinda want to keep the paperback around just for that. I know what you mean, Robert, and I personally haven’t read this one, so couldn’t say; but sometimes, might there not be an element of irony involved? This is one of my favourite books, in fact, about matriarchal Crete (I hope this link comes out; but mine usually don’t!). Yep, it just… arghhh. So annoying. I bought this one when the ebook was on sale, just couldn’t resist that gorgeous cover. I’ve seen mostly tepid to okay responses to this book, which makes me kind of hesitant to dive in, but I’m glad it was enjoyable enough! I’ll probably wait to see what others make of book two before starting the series. The cover is maybe the best part… I’m not in too much of a hurry to read book two, especially since English-language books are so expensive here in Belgium! Yep, this pretty much sums up my feelings about this book. So much potential but executed poorly in the end. I’m not super eager to read The Sleeping Prince, either, I haven’t seen any reviews yet so I’ll wait a bit to see if it’s a good conclusion to the story. Is it meant to be a duology? If it’ll definitely finish up the story, I might have to read it for curiosity’s sake.